On Wednesday 11 May 2016, during the United Nations Permanent Forum on Indigenous Issues (UNPFII), the United Nations Development Programme (UNDP) and the International Indigenous Peoples’ Forum on Climate Change (IIPFCC) co-hosted a side event to report on indigenous peoples’ participation in UNFCCC COP 21 and reflect on the outcomes and achievements of their advocacy and engagement. Panellists were welcomed by a full house and a number of viewers joining via live webcast. We are pleased to confirm that the first meeting of the Facilitative Working Group (FWG) will take place on 14-16 June, and it will be held at a venue in Bonn. More information about the venue/registration will be made available on the webpage as it becomes available. The meeting will be open to observers. A separate registration (from the SB registration) will be undertaken for the FWG meeting. In addition, the mandated LCIPP in-session thematic workshop is planned for for 19 June (the date will be confirmed soon when the SBSTA overview schedule is published), more information, including about which room it will be held in, will be made available on the website soon. Further LCIPP activities are also being organized, we will continue to keep you informed. Nominations to the FWG: nominations are still pending for 3 Party representatives (from Eastern Europe, WEOG and the LDCs). Nominations for 5 alternates are also pending (from Eastern Europe, WEOG, LDCs, SIDS and Asia Pacific). Here is the list of membership. The first activity of the Local Communities and Indigenous Peoples Platform (LCIPP) was a multi-stakeholder workshop, which took place on 1 May, 2018. The workshop focused on implementing the three functions of the Platform: knowledge, capacity for engagement, and climate change policies and actions. During this day-long multi-stakeholder workshop, a group of more than one hundred participants convened and converged on the need to collaborate and commit to enabling the full operationalization of the Platform and the implementation of its functions. To review and download the full LCIPP Workshop Summary Report, click here. The Summary Report was prepared by the UNFCCC Secretariat under the guidance of the co-moderators of the workshop, Mr. Paul Watkinson (Chair of SBSTA) and Mr. Roberto Múkaro Borrero of the Taíno people (International Indian Treaty Council). It is intended for information; to capture, as well as possible, the rich exchanges that took place during the workshop; and to provide a written record of the proceedings. We transmit herewith a note in our capacity as Co-Chairs of the Indigenous Peoples Caucus, convened under the International Indigenous Peoples Forum on Climate Change (IIPFCC) during the Bonn Climate Change Conference 2018, which included the forty-eighth sessions of the Subsidiary Body for Implementation (SBI48) and Subsidiary Body for Scientific and Technological Advice (SBSTA48) as well as the fifth part of the first session of the Ad Hoc Working Group on the Paris Agreement (APA 1-5). 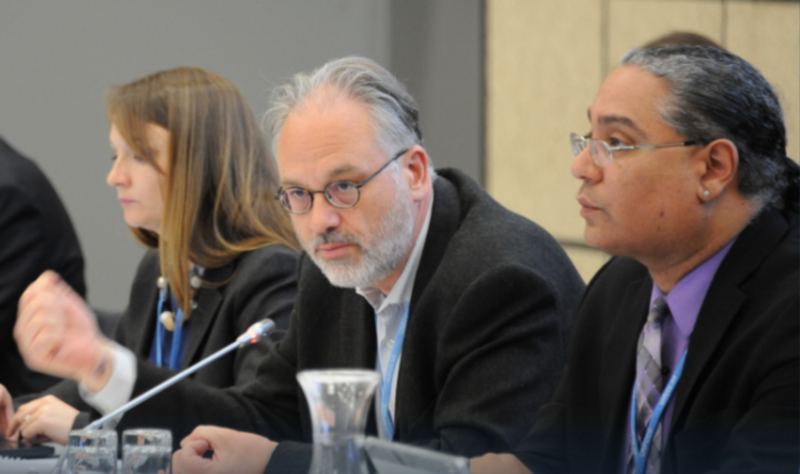 In accordance with the collective view of the Indigenous Peoples Caucus expressed during its preparatory meeting on April 29 2018 at the Evangelischer Kirchenkreis in Bonn, the Co-Chairs have prioritized the negotiations to further operationalize the Local Communities and Indigenous Peoples (LCIP) platform in the coordination and deliberations of the Indigenous Peoples Caucus during the 2018 Bonn Climate Change Conference. As a variety of proposals have been made by Parties and the IIPFCC during the negotiations and, in order to ensure that the document which will be finalized during the twenty-fourth session of the Conference of Parties (COP24) reflects the views of Indigenous Peoples, and to safeguard the ownership of the document by Parties and Indigenous Peoples, we, as Co-Chairs, have worked to provide a note on the current status of said platform and the dangers involved in some of the proposals made by Parties. We highly value the importance of open, transparent and inclusive consultations between Indigenous Peoples and Parties, and encourage all interested Indigenous Peoples, Parties and other stakeholders to raise any ideas and concerns with us. Should any organization, Party or groups of Parties wish to consult with the IIPFCC through its Co-Chairs, please contact the Indigenous Peoples focal point to the UNFCCC Secretariat (Mr. Lakpa Nuri Sherpa, email: nuri@aippnet.org). We are committed to engage further in a constructive dialogue on this important subject before and during COP24. Please accept, the assurances of our highest consideration. You can find the event details here. If you are participating remotely, you are welcome you to tune in via Skype here. You can also submit your questions by visit here, and keying in the event code #LCIPP (in capital letters). We also welcome you to interact with us via social media using the event hashtag #LCIPP. At COP 23, Parties initiated the operationalization of the local communities and indigenous peoples platform.